The landscape of news media has drastically been changed since the commencement of digital media, decelerating the ad sales for printed newspapers. 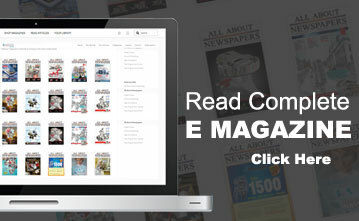 Regardless of the technical advantage of the online medium, which eventually makes news dissemination instant, easier and broader than any other traditional medium, digital media however gives printed newspapers a tough time in ad revenues, which went virtually flat over the last few years, whether in it is India or overseas. What’s the solution in this? Here is the solution—printed newspapers must adopt new business models. It’s about learning to care for both the printed and digital formats side by side. Digital must be a threat to the traditional media; but on the other side, this medium can be used as an added advantage. An example in this context is the creation of consumer-oriented ads and articles that bridge printed newspapers to online buying. In this, printed newspapers must aim at turning anything in their articles or ads into offerings for their readers in a customised manner. The example: in a printed newspaper, when readers see an intriguing product or service in an ad or a write-up, what they would require to do is to take picture of it with smart-phone or upload it. After that, readers could get more information about the item, see what others have commented about it, watch a video on how to use it, find out the shops where it is available and could shop it online directly from the company’s website. And people believe in this, because printed newspapers still remain the most trusted and authentic medium, unlike the battering social media or online news media platform. Moreover, printed newspaper houses in India are now adopting high-end printing machines, technologies and workflow solutions, coping wisely with the transition taking place in the industry, in order to boost readership. This is an effective new business model indeed. Over the last few years, it has been found quite commonly that small and medium newspaper houses, alongside their big counterparts in big metros, have constantly been going for fully automatic colour and cut-off register systems, designed to enhance colour and print production. This is yet another way for printed newspapers to grow unconventionally, with new texture and look, pulling extra attention of their readers. There are several business models that have not yet been properly explored by the printed newspapers to boost readership. Every newspaper house must study the potential of new business models. The point here is that a good business model must be time tested when it extends more broadly into the media landscape. And effective business models bring results that may ultimately show a surprising amount of reader loyalty to printed media, even in this digital era.